The Freedom From Religion Foundation is pleased to learn that the U.S. Senate has voted for a must-pass spending bill that does not contain language to repeal the ban on church electioneering. This news comes after the U.S. House approved a provision slipped into the FY 2019 Financial Services and General Government Appropriations bill to cripple the Johnson Amendment. The provision in the House bill would make it nearly impossible for the Internal Revenue Service to enforce the Johnson Amendment, enabling churches to promote political viewpoints and endorse candidates running for office without penalty. Moreover, this language in the bill weakens this crucial protection for churches against political corruption. Diluting the Johnson Amendment would make the Citizens United decision look trivial and nominal by comparison. If the amendment is repealed, billions in dark money will inevitably flow into and out of churches for political purposes, pressuring churches to become dark money conducts. The spending bill will now go to a congressional conference committee that will hash out what language gets put into the final version of the bill. 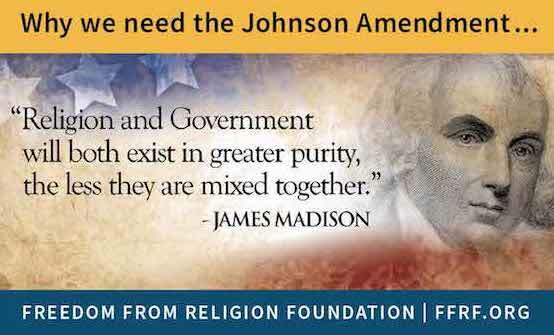 FFRF is affirming the need to maintain the full enforcement of the Johnson Amendment in this must-pass legislation and condemns any attempt to turn churches into PACs. "Theocrats in Congress are trying to errode the wall of separation," says FFRF Co-President Annie Laurie Gaylor. "FFRF and our members will not allow them to get away with this." The Freedom From Religion Foundation is a nonprofit membership organization that advocates for the separation of church and state and educates on matters relating to nontheism. It has more than 32,000 members residing in every state of the United States, and in the District of Columbia.